October 18, 2016 - New Yorker Electronics is now distributing Vishay’s newest optoelectronics sensor, the Vishay Semiconductors VCNL4100. The VCNL4100 is an Ambient Light Sensor and also a Proximity Sensor with long-distance proximity detection up to one meter. It combines a high-power IR emitter, photo detectors for proximity and ambient light, a signal processing IC, and an 8-bit / 16-bit ADC in a compact 8mm by 3mm by 1.8mm surface-mount package. The three-in-one sensor features an interrupt function and supports I²C bus communication interface for smart home, industrial, and office applications. Offering a five-fold increase in proximity detection over previous-generation devices, the VCNL4100 provides presence detection for display activation in printers, copiers and home appliances; collision avoidance in toys and robots; lighting control in offices, corridors, and public buildings; lavatory appliance activation; and vehicle occupancy detection in parking lots. Containing the circuitry needed for these applications in one device, the sensor eliminates the need for additional light barriers and optical alignment of the IR emitter and photo diode. The device’s small outline saves space and gives design engineers greater flexibility in where and how they locate the sensor. 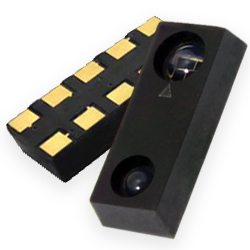 The ambient light and proximity sensors of the VCNL4100 operate in a parallel structure, and each offers a programmable interrupt function with high and low thresholds that allows the sensor to wake up an application from a low-power mode, reducing the overall power consumption of an application. The device’s Filtron technology enables ambient light spectral sensitivity close to that of the human eye while offering excellent background light cancellation capabilities.